Five separate sets of high-quality, hand-stitched textile banners are available for short-term hire to churches and organisations in England, Wales and Scotland. The banners are exact replicas of the textile screens produced for the Cathedral Exhibitions from the Creation, Jesus Is, Prayer, Our Father and Servant King exhibits. The Creation banners are a set of ten high quality, 6ft x 2ft, full-colour, hand-stitched textile banners. The art work and poems tell the Creation story as found in Genesis chapter 1. This can act as an introduction to the Creation story for those who do not yet know it or as a fresh look at a well-known passage of the bible for others. The Lord's Prayer is an extremely well known part of the Bible – one we can often take for granted. We can say it without really thinking about the words we speak and their meaning. The OUR FATHER banner display explores the Lord's Prayer theme but from the viewpoint of a child addressing their father. 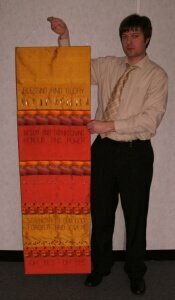 The banners feature 2 prayerful poems by Paul Field. One sets out ideas and encouragement to pray. And the other is imagined from God's perspective. The OUR FATHER banners are a set of ten 6ft x 2ft textile banners and are available to hire for either up to 4 weeks for a standard fee of £50 or for up to 2 weeks for a fee of £25 (plus any carriage/postage expenses). If a church requires them for longer, then this can be arranged and may cost slightly more than the standard hire fee. With the set of ten OUR FATHER banners, we include 200 Prayer response cards, produced by SGM Lifewords in partnership with the Christian Enquiry Agency. "Jesus is..." is based on 8 famous sayings about Jesus and two screens displaying "The Father's Love Letter". A recent survey found that 40% of adults in the UK felt that prayer changes their lives, with 42% saying that they pray. There is so much prayer in the Bible – it is one of the most natural things that we can do. Jacqui Frost has produced a set of ten beautiful, hand-stitched, textile banners (6ft x 2ft) that explore the theme of prayer. The Prayer response cards can be made available for those who want to find out more about Christianity or take a next step of faith or just to write a prayer request that will be prayed for. The cards can be sent freepost to CEA who will handle the prayer request and/or send appropriate material if asked for, along with a personal letter giving ideas and offering further help. The cards may also be coded by the host church, so that CEA can then let the church know how many responses there have been and also refer any requests for follow-up, through Contact for Christ. The Servant King exhibition is inspired by the Graham Kendrick song of the same title. Hire of one set of banners costs £50 for month hire or £25 for a 2-week hire. Longer hire periods may be also negotiable at a rate of £25 for every 2 extra weeks – however this is dependant on availability. We run a rolling diary system on a first come - first served basis, so if you would like to hire the banners, please contact us at least 6 weeks before your proposed hire date – the sooner the better. Certain periods of the year are particularly popular, such as Easter and Harvest time so please be aware that you will need to book very early (start of the year) to reserve the banners for these times. 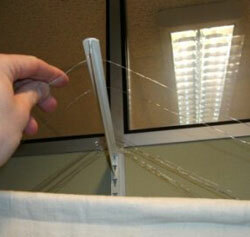 The banners are hung using wire thread, so they will need something like a small hook to hang from. The banners are intended only for use indoors and should especially be kept away from water and damp/condensation. We also ask that the hirer adds the banners to their insurance for a value of £100 per banner. The banners are packed into a strong box and sent by courier to the hirer, along with the relevant cards, leaflets and literature as part of the hire. We ask that this box is retained and the banners can be sent back to us in it after the hire period is over. If you would like to discuss hiring the banners please telephone the Deo Gloria office on 020 8651 6428 during office hours please email.